The Rokinon 24mm f/1.4 ED AS UMC Wide-Angle Lens is compatible with both full frame and crop frame sensor Nikon cameras. There is no AF or auto exposure on this lens so it is suitable for videography or any other work that can't have lens motor sounds. It features a close 9.84" focusing distance, allowing for very wide closeups. It is wide enough for landscape shooting, interiors, street photography, and large group portraits. It is also suitable for night sky photography as it produces less star coma than many other lenses. 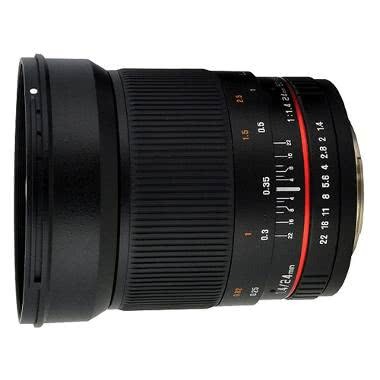 This is a manual focus only lens. It is compatible with full frame and crop frame sensors.